A Doctor and his assistant return from the UK to Shanghai to set up a clinic to help the poor, and quickly end up in the wrong books of the local Axe Gang. With murders of children going on in the area, the doctors resolve to find out who is behind it. After curing a throat infection of the sister of the Axe Gang's leader, he is in debt to them, and they ask for his help in tracking down the murderer. Above is my own brief synopsis for the film, as below is what is written on the back of the DVD, which is NOTHING like what happens in the film! 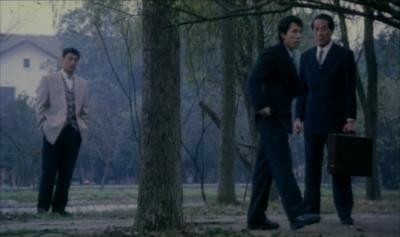 Shanghai Affairs is a Donnie Yen vehicle in which he both directs and stars. Combining a story, good guys, bad guys and martial arts into one film. He had tried this before in Ballistic Kiss which turned out to be a very lacklustre film, so the question I was asking myself before I watched Shanghai Affairs was "Could he improve?" "The Axe Gang posse... keepin' it real!" Before I answer that question though I'll give a brief summary of the plot. There are a couple of main story lines which run through the film, Yen is, of course, involved in both. Yen is Dr. Tong Shan, a man highly skilled in martial arts, and also a highly qualified western medicine Doctor. He has returned to Shanghai, with his assistant Bond, in order to set up a clinic in a very poor part of the city, but very quickly learns that the local Axe Gang have an interest in that particular plot of land. The Axe Gang are lead by Lo-Chi (Yu Rong Guang), another highly skilled fighter who can be very brutal when it is gang business, but is extremely compassionate and caring when it comes to his sister, Shen (Athena Chu). She suffers from a severe throat illness which has stopped her from being able to speak for the past 15 years. Lo-Chi, despising doctors, believes that praying to the Fox God is the only way in which she will be cured. "You've just farted, haven't you?" 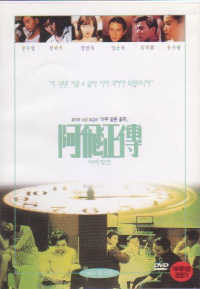 With Tong Shan and Lo-Chi crossing paths, Shen also becomes aware of Tong Shan and that she can be cured from her illness if she undergoes an operation on her throat. This she does, without her brother's approval, which makes Lo-Chi and the Axe Gang even more against Tong Shan and his assistant. However, once the operation is over and she has had a short time to recover, she is able to speak, bringing Lo-Chi into Tong Shan's debt. At the same time Shen clearly starts to develop feelings towards Tong Shan, with his all American white teeth smile! While all this has been going on, children have been disappearing from the streets, being abducted by a group of men, and are then being found in sacks, dumped in the river. The children have all been murdered and their internal organs removed. One child which went missing, was a child quite close to Tong Shan and Bond, and this inspires them to become involved in the investigation to track down the killer. 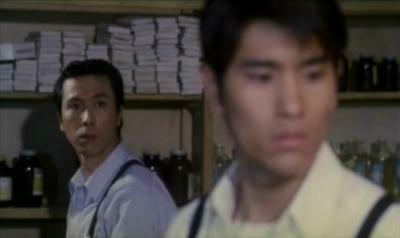 To aid their task, Tong Shan asks Lo-Chi to find out what he can for him, thus repaying the debt, which he agrees to do. "How embarresing. Caught in the bushes by so many people!" However, it soon becomes apparent that Lo-Chi has his own interests in mind, and what happens next is something that you'll have to watch the film to discover! I've got to give credit, Shanghai Affairs does attempt to deliver a reasonable story on top of the action. The plot with Shen and Tong Shan is by far the weaker of the plot lines, and if anything is only really there with the purpose of setting up meetings between the main characters. The plot with the missing children is actually quite a decent story, however, not enough is made of it, and as such it loses power. Anything with children being murdered in cold blood has the potential of being a story that envokes emotions in the viewer. Having the children's internal organs removed is a good stroke as it makes the viewer despise the person behind it even more, due to its sick brutality. But as about 60% of the film is about Shen and her interations with Tong Shan, a lot of possibilities for the children plot are lost. Intead of being a gripping, emotion stirring story which it could and should have been, it is too fragmented and in the background of the film to have anywhere near that power - which is a real shame. "Stay there while I vault up and kick you!!!" So the story had potential, but it wasn't realised. However, this is primarily a martial arts film, so there is still plenty of opportunity for redemption in the fight scenes. Again this is another wasted opportunity. 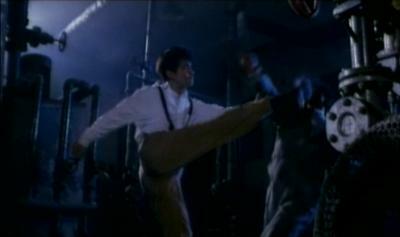 There are quite a few fights in the film, some of which have the camera far too close to the action to see properly what is going on, some use quite obvious under-cranking, and some others are ok. Alas there is nothing really breath-taking, or really that memorable about any of the fights. Well that's not really true, what I remembered about the fights, particularly the ones involving Yen, was that they could have been much better. The main fight at the end is nothing special, and not he big finally which it kind of promised to be. There are good moves going on in places, but nothing that lights up the screen. There are a couple of scenes where Yen takes on like 20 people from the Axe Gang at once... but this is another one of those fights where it is 20 people fighting him, one at a time. Once one guy has been knocked down, another is there a fraction of a second later. There were not enough genuine many Vs. one choreographed fights. Acting wise there were a few good performances in there. Yen did his best to show of his sparkling white teeth as often as possible (well ok, he didn't really but it did feel like it at times! ), and Yu Rong Guang did very well in showing his evil side as the Axe Gang leader, then contrasting it completely with his compassionate, caring side towards his sister. Other than that, all other performances were typical stuff... your usual gang henchmen, the impatient assistant who is good, but not quite good enough, that sort of thing. All in all, Shanghai Affairs is a disappointment. I did prefer it to his other directorial effort which I've seen, Ballistic Kiss, but then I didn't think too much of it either! Potentially, this could have been a good film. I've seen Yen in some great fight scenes before, so he has the ability there, the story could have been very good, but was dragged down not following the better plot line enough. While it probably never would have been a classic, it could have been an above average martial arts film. 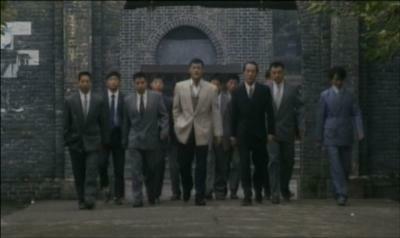 Instead it is a below par film, which is only really worth viewing if you are a die-hard Donnie Yen fan. "You look so much taller from down here!" The audio track I listened to was the Cantonese mono track. As far as mono tracks go, I guess it was ok. There was nothing that special sounding there, but probably more importantly there wasn't anything that bad sounding in it either. The only time it did get poorer was when a song came on and the singing voice was a bit distorted. That could possibly just have been my TV speaker, but it has never happened with it before, so I think it is more likely to be the DVD audio track. 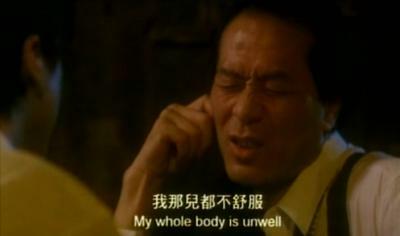 Unfortunately the subtitles are not removable. They are burnt in Chinese (traditional) and English. They are a white font, with no background. Fortunately I don't recall the screen being that light at any point when there were subs on screen, so they are readable at all times. However, there are several instances of bad spelling and bad grammar. Not bad enough that the whole meaning of the sentence is lost, but bad enough to be annoying at times. "You stick your right foot in..."
The film print is a bit of a strange one. At first I thought it was actually quite good, as I couldn't really see much grain, and there were very few speckles of any sort. The onyl niggle was there were no vibrant colours on screen, the colours did seem a little muted. Then in some scenes it went pear-shaped. There were speckles everywhere, the print was clearly much softer and the colour reproduction was off, with a green tint in some places or something similar. This was only in a few scenes though. Most of the print is ok to decent, but the sections that are not are really pretty poor. Extras wise there is very little to chose from. There are Star's Files on both Donnie Yen and Athena Chu, which are in an option of Chinese or English, there is the trailer for the film, and also the trailer for Ballistic Kiss, and that is your lot. So basically nothing of great susbstance. "Damn we look calm and cool right now..."
Overall Shanghai Affairs is a disappointment in all departments. The story could have been better, the fighting could have been much better, and the whole DVD presentation could have been better. 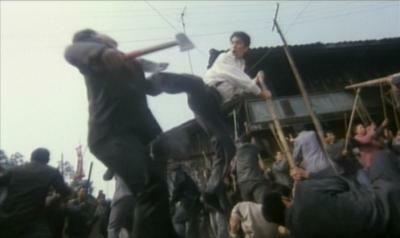 Like I said, the film is only really worth seeing if you are a big Donnie Yen fan. So to answer my original question, yes it is an improvement over Ballistic Kiss, but not by much, and the bar was pretty low to start with.